County Galway in the latest issue of The Irish Journal of Earth Sciences, published by the Royal Irish Academy. The fossil has been named ‘Crepidosoma doyleii’ in honour of its discoverer Dr. Eamon Doyle, geologist for the Burren and Cliffs of Moher UNESCO Global Geopark and Clare County Council. The fossil specimens are presently housed in the National Museum (Natural History) in Dublin. 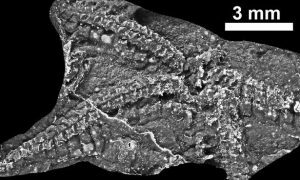 The study by international researchers from the USA (Prof. Daniel B. Blake), the Netherlands (Prof. Stephen K. Donovan) and UK (Prof. David Harper) describes a new species of an ophiuroid starfish, commonly known as a ‘brittle star’. Brittle stars first evolved around 500 million years ago and have survived relatively unchanged to the present day, although the ocean that was home to ‘Crepidosoma doyleii’ subsequently disappeared some 400 million years ago due to plate tectonic movements of the Earth’s crust.